There is something deeply fascinating about Harry Stubbs, the protagonist of the titular Harry Stubbs Adventures series written by David Hambling. I’ve read all four titles featuring Stubbs, and he is one of the few characters in Mythos fiction that has actually stuck with me after finishing the books they are featured in. Indeed, I have no hesitation in calling Stubbs one of the most well fleshed-out and sympathetic characters I’ve ever encountered in the Cthulhu Mythos and Cosmic Horror genres. I think the core reason for that is because Hambling has deliberately crafted a character that goes against the grain in terms of many of the tropes commonly associated with Lovecraftian fiction; as a result, his characteristics and temperament stand out and become memorable for the reader. Although Stubbs’ involvement with Shoggoths, deities and other assorted cosmic horrors escalates quite rapidly, particularly in the later books in the series, Stubbs doesn’t follow the ‘standard’ stereotype for protagonists in Lovecraftian fiction: although he finds his world-view challenged, and often questions his sanity as a result of what he experiences, almost uniquely he doesn’t immediately submit himself to a psychiatric facility; fall into a vice like drugs, alcoholism or more esoteric pursuits; or commit suicide because he cannot handle the cold, harsh realities of the universe that have been revealed to him. Rather refreshingly in fact, Stubbs is able, to a considerable extent, to integrate these revelations into his general worldview and carry on his work (and his adventures) and ensure the longevity of both himself as a character, and therefore the series that he inhabits. The ability of Stubbs to cope with what he encounters might come across superficially as improbable, even impossible, given the standards for the Mythos genre set by Lovecraft, Derlath and the many other writers who have continued the genre over the past century. However, Hambling has gone to an incredible amount of effort to imbue Stubbs with a personality and background that allows him to overcome the usual genre tropes – tropes and stereotypes that have, quite frankly, become quite stale and predictable in many ways. As previously mentioned, Stubbs doesn’t fall into a vice or mental instability, and instead seems to be able to treat his encounters as just another barrier to overcome in his progress through life; and that’s because, as Hambling makes clear, Stubbs is a man who has struggled with barriers his entire life. Constantly attempting to escape his limited, working class background, Stubbs is on a course for self-improvement and refuses to allow anything to block him, occult or otherwise, exhibiting an endearing kind of stubbornness as a result. This self-improvement comes out most clearly in how he characterises himself, as each novella and novel is actually penned by Stubbs himself as a recollection. Initially working as an agent for an insurance company, he holds himself carefully, exhibiting both a polite deference to those above his class, but also a dogged insistence in completing his duties regardless of the class or status of the person he is dealing with; much as with Shoggoths, they are merely something to be overcome via tact, patience, stubbornness and the occasional use of his fists. Another interesting aspect is Stubbs’ background as a veteran of the First World War; it’s a standard trope of the genre for the inter-war period, but Hambling deftly subverts it by establishing that Stubbs was both an NCO, rather than an officer, and also served in the Royal Artillery, rather than the infantry arm. This way, Stubbs still has the skillsets of a military background, and has seen the realities of the Great War, but is not plagued by nightmares of trench service; it also feeds into his desire to increase his social standing and improve himself. And such is Hambling’s skill as a writer that he is even able to highlight this need for personal development in the language and prose used by Stubbs as he transcribes his adventures in each of the books; the language used is often deliberately exaggerated, or excessively formal, demonstrating his use of things like a correspondence course to improve his lot in life. Add in the paternalistic but slightly sinister character of Arthur Renville, a ‘fixer’ and smuggler operating out of Norwood who has a soft spot for Stubbs; and a pair of mysterious strangers attempting to get hold of the mysterious treasure, for wildly diverging ends; and some excellent action scenes, in particular a brilliantly-choreographed and distinctly brutal ending, and you have a recipe for a fantastic piece of Mythos fiction. Hambling has a great eye for atmosphere and pacing, drawing out the innate tension as Stubbs slowly but resolutely pursues the treasure and an understanding of what its true provenance is, but the real joy in the novella are the characters, in particular Stubbs. There wasn’t a moment reading (and re-reading) the novella when I felt anything less than completely invested in his character and his attempts to both improve his lot in life and satisfy his insatiable desire for knowledge, ordinary or occult, and I quickly came to appreciate the subtleties in Hambling’s depiction of Stubbs. 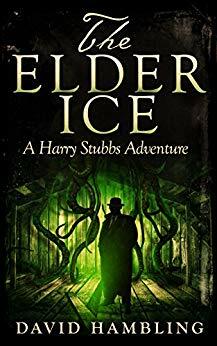 The Elder Ice is a brilliant achievement by David Hambling, rich with period detail, atmosphere and a keen eye for characterisation, and in addition acts as a rock-solid foundation for the full-length novels that come afterwards, and which will be the subject of future reviews on this blog. Amazing review. I write Cthulhu fiction myself (Cthulhu Armageddon) and have had the pleasure of collaborating with David Hambling on a couple of projects. He’s a great professional with a true love of the subject. His historical accuracy in the books is also to be lauded. He truly brings the post-War London era to life. And I’d highly recommend Hambling’s collection The Dulwich Horror and Others which has some very interesting connections to the Stubbs’ books. Just wondering if you’ve read any of the others yet? I’m afraid real life has got in the way a bit, but I do still plan to go back and re-read and review the rest of the series!